Mix all the ingredients and knead the dough, it should be firm. After applying a little ghee on palms, roll medium sized balls of the dough. Keep them on a baking tray which has been lined with oil / ghee. Bake them at 150 deg for 55 mins. Turn them to get an even brown color. I doused them with more white butter and baked them for another 10 mins for extra crunchiness. Serve with daal and veggie, with a generous serving of ghee / home-made butter I made mix veggie with nutrela. 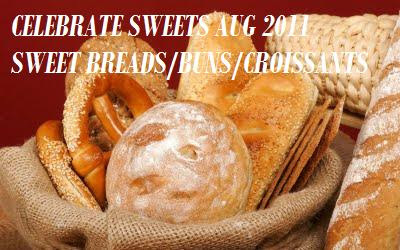 CELEBRATE SWEETS - SWEET BREADS/BUNS/CROISSANTS EVENTAlso check Nivedita's blog for the original event posts.